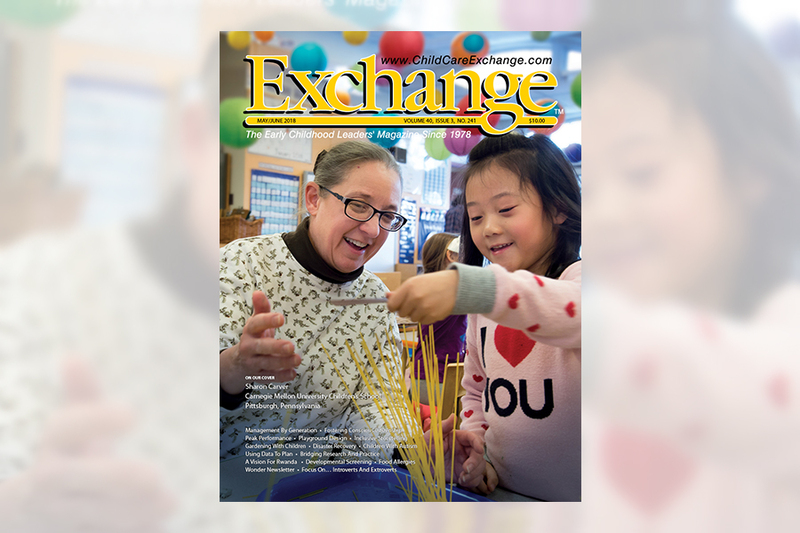 The May-June 2018 issue of Exchange features Carnegie Mellon University’s Sharon Carver, director of the Children’s School, on its cover. Carver wrote the accompanying article, “Campus Learning Laboratory,” and outlined the school’s 50-year history and what makes it a gem on the CMU campus, in Pittsburgh and for researchers and students worldwide. “Our philosophy has always been based on theories and research in developmental psychology,” wrote Carver, who has led the Children’s School since 1993. The 96-student school facilitates observations and research in a range of disciplines, from early childhood development and educational practices to child-friendly furniture design and more. And the children benefit from an environment dedicated to developmentally appropriate productive learning. Over the past half-century, it has become one of the most sought-after preschools in the Pittsburgh area. Exchange is an early childhood education magazine. Read Carver’s full article.